BLOG | Global Arts Corps | Can we forgive the past to survive the future? La MaMa Experimental Theatre Club will present the U.S. Premiere of Kosovo’s Qendra Multimedia in “55 SHADES OF GAY: BALKAN SPRING OF SEXUAL REVOLUTION,” a contemporary burlesque story about LGBT+ politics in the Balkans, written by our dear friend and colleague, Jeton Neziraj, and directed by his wife, Blerta. I have had the pleasure of knowing Jeton Neziraj for ten years now. We first met in Kosovo when Jackie and I brought our GAC production “Truth in Translation” to the National Theatre of Kosovo. He was the artistic director there at that time, always controversial. He is a man of explosively creative passion, with the theatrical and personal courage to support it. He also has a dramatically delightful disregard for political correctness, combined with the ability to find humor anywhere he looks. Known in Europe as a theatrical provocateur, Jeton will be part of the collaboration team of our next international project, the Festival of Radical Recovery. How ironic that he is bringing his “55 Shades of Gay” to NYC, the progressive mecca of LGBT+, just when the U.S. is pedaling back on gay rights under the Trump administration. If any of you in NYC has the chance to make it down to La MaMa, I think you would enjoy meeting Jeton after the show. Let us know, and we’ll try to arrange it. He is almost as entertaining as his plays. “55 SHADES OF GAY: BALKAN SPRING OF SEXUAL REVOLUTION” runs March 7 – 17, Thursday – Saturday at 7pm and Sunday at 3pm with an additional performance Monday, March 11 at 7pm. Running time is 70 minutes. The Ellen Stewart Theatre at La MaMa is located at 66 East 4th Street, New York City. To purchase tickets, call 212-352-3101. Announcing the Festival of Radical Recovery! To continue our end-of-year update on the large, new project called the Festival of Radical Recovery (RR), we are about to gather together a large and inclusive cast of actors from conflict zones around the world, on a single stage where they will all move backward in time to meet their past. They will not know each other. They will all be present in family units created by their country’s underground theatres about the conflicts of the past, some percolating again just beneath the surface, and will morph and shift into their immediate ancestors as they move backwards in time. They will rehearse together, across languages and cultures, to find their differences and their common ground. The purpose is to use our kaleidoscopic rehearsal process, developed over the last 15 years, to place conflict cultures together where reality prevents them from even knowing about each other. It’s about identity. It’s also about hope and empathy which become the habitat of youth. In adults, especially in times like these, hope all too often seems like a kind of prayer for help from some outside power. For youth in recovering societies, hope is life itself. In adults, especially in times of perpetual mistrust and imposed reconciliation, empathy is all too often an unwanted moral sanction, someone else’s idea of what is good for us. For youth, it’s a release from inherited enmity; potentially the joy of pure curiosity about others. Young Cambodian cast members of “See You Yesterday” at the Kigeme Congolese refugee camp, 2016. We started this large interconnected, global project because we discovered in our previous binary explorations of conflict in single countries or regions that survivors lack the means of communication with counterparts around the world; and miss the opportunity to share personal stories, insights, reconciliation struggles, even rage that would reduce their isolation. Our lens has always been through the youth of conflict nations: the young interpreters of South Africa’s Truth and Reconciliation Commission, the ultimate witnesses; the teenagers in Northern Ireland after the Peace Accord who counted among the 60% increase in youth suicides; the orphans and descendants of the Cambodian genocide who found hope in becoming the nation’s “social” youth circus in our current touring production of “See You Yesterday,” which is the basis for our new documentary, and which will premiere at ArtsEmerson in May 2019. Our work with youth will now move into a wider global frame through a shared theatre production, rehearsal process, and simulcast to millions from the first-ever Festival of Radical Recovery (RR) over the next three years. This next production is about connections and intersections. About theatrically connecting our children by going back in time and seeing how we started so pristine and how we came to where we are; connecting youth survivors to each other across time and geography, to their elders and to their past. Theatre is the incubator. Youth is the lens. We should be learning from our children how to survive the future to forgive the past. We have come full circle from our first production “Truth in Translation” to the Festival of Radical Recovery–performed and broadcast from iconic conflict zones across the world. By traveling through time and across an emotional landscape theatrically, our purpose is to stop killing each other’s children even if we seem incapable to cease killing each other. The trick is: How long can we prolong the kids’ genius for truth before we default to teaching them how to be like us. For the Festival of Radical Recovery, we have created an incredible Advisory Council of artists, human rights leaders, journalists and scientists; continuing the legacy of our first Institute of Perceptual Change. More about the advisers in our next newsletter. In the meantime, as our constant support group of followers, we want to hear your ideas and any ways that you can help us to launch this bold new GAC Project. In a world gone criminally mad, to lose such a man must make us doubly committed to finding more among the youth of the world to carry on the spirit of his fight. We are honored to say that Alex was a father to our work and a very special friend to all of us at Global Arts Corps. His calming smile balanced by his fierce passion was the antidote to capitulation. He was a beacon for forgiveness while risking his and his family’s life for justice and basic human rights. 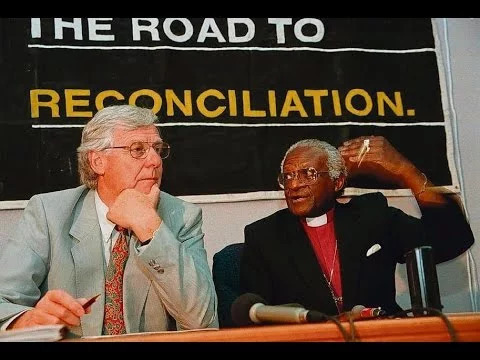 With Archbishop Desmond Tutu he served as Co-Commissioner of The South African Truth and Reconciliation Commission (TRC) which acted on the premise that justice and truth were co-equal. It was Alex’s book that gave me the idea of presenting the TRC through the eyes of the translators, which became the basis for the story of our production of “Truth in Translation”. For us at Global Arts Corps. he was a constant and consistent inspiration. For me, he was a mentor. He literally taught us that hope resided in our despair and so we should respect both. He gave me courage when giving up would have been easier. “A great light has gone out. Alex has passed – peacefully in his sleep. Eyes open, filled with wonder, a smile on his lips. Courage to us all in the coming year, and many thanks for your support of Global Arts Corps. In 2019, after 15 years in the field, we are embarking on an ambitious new project; an unexpected consequence of all that we have done before. The largest cast of actors we have ever convened, from conflict zones around the world, will travel back in time to address the DNA of the world’s continuing chaos, together on a single stage. This theatrical “social experiment” will be generated from each culture’s present and historical conflicts to examine the structures creating individual and national identities…identities that ultimately demonize the “other.” We will be putting social chaos on the stage because we feel it is the only way to find the simple order that binds us together. -In March, the young Cambodian cast of “See You Yesterday” (SYY) performed for over 4,000 audience members in three cities in their home country, and gave workshops for over 800 teachers-in-training. We were supported in this endeavor by the Robert Bosch Stiftung Foundation, which also supported the 2016 Rwandan tour to the Ubumuntu Arts Festival at the Kigali Genocide memorial, and the Kigeme Congolese refugee camp, where the cast performed for over 20,000 people. -We have been invited to present the U.S. premiere of “SYY” in May 2019, at the Robert J. Orchard Stage at ArtsEmerson in Boston. We will send you a “save the date” newsletter, and hope some of you will join us to see these remarkable performers, who have become the first phase of our burgeoning youth program. -This November in Paris, seven Global Arts Corps team members from around the globe met with a team of six UNESCO program heads to discuss our new project and our future work together. Discussions are underway to bring “SYY” performances to UNESCO’s magnificent, state of the art theatre. -Finally, we have been extremely fortunate to assemble an extraordinary new advisory council of eminent artists, statesmen, journalists and scientists whom we will introduce in our next post. It is only with your support that we can continue to do the work we are doing, and should you choose, we gratefully welcome gifts of all sizes. We hope you will keep us in mind with your end-of-year donations before December 31st by making a tax-deductible contribution to Global Arts Corps either through our website, or by mailing a check to Global Arts Corps at 790 Riverside Dr. #6P, New York, NY 10032. As always, our sincere thanks for your inspiration and support, and happy holidays from all of us at Global Arts Corps. This past March and April, Global Arts Corps re-joined the cast of “See You Yesterday” to tour three major cultural hubs in Cambodia and conduct workshops at the regional teacher training centers, the colleges where all of the country’s future educators receive their training. For decades, the genocide perpetrated by the Khmer Rouge was excluded from Cambodia’s national schoolbooks. Survivors of the regime were often too traumatized or ashamed to speak about their experiences openly, and younger generations didn’t feel safe enough to ask their burning questions about what had happened. “See You Yesterday” was created to break a silence. During 19 weeks of development and rehearsal spread out over a 5-year period, the cast created a theatre production using their spectacular circus skills to explore their parents’ and grandparents’ memories of a genocide they had never lived. In the process, they discovered powerful and simple ways of creating understanding and empathy between themselves and their elders. After touring “See You Yesterday” to the Kigali Genocide Memorial Center for a festival and then performing for 18,000 people in the Kigeme Congolese Refugee camp, this group now felt ready to share their insights with their country’s future teachers back at home. They performed for diverse audiences in outdoor, free, public performances in Phnom Penh, Siem Reap, and Battambang to over 4,000 people. In these audiences were a total of over 800 young Cambodian teachers in training. On the days following each of these performances, they shared with these teachers what it felt like to live in the shoes of their elders; to imagine their lives out of the broken, inherited fragments of stories and rumors that floated through the silence. They talked about what it felt to start asking questions for the first time. They shared their feelings about how it was frightening at first… and how they needed to learn to trust their own feelings and not run away from uncomfortable truths. They demonstrated some of the empathy and trust exercises they found they needed to perform as a community of actors. They talked about learning how to let their own personal humor and courage and compassion enter into the pain of the stories they were revealing. They told how hard it was to rehearse things they didn’t believe in, only to realize that once they rehearsed something, they could understand it. All of us at Global Arts Corps would like to thank the supporters who have stayed with us throughout the time it took us to reach this point, in particular, the Robert Bosch Stiftung, who gave us confidence as well as support from the earliest stages of this project. We’d also like to thank Khuon Det and everyone at Phare Ponleu Selpak and Phare Performing Social Enterprise for inviting us to collaborate with this extraordinary group of young artists; and the teams at the Documentation Center of Cambodia, Amrita Performing Arts, and Cambodian Living Arts for all of their counsel and support over the last six years. We would not have been able to create this piece without all of the work that came before it, out of places like Belfast, South Africa, and the Balkans. On this tour, we witnessed 19 young circus performers using theatre-based techniques to teach 800 future teachers how to approach a past their elders could never talk about. Thank you to everyone who has invested in us and stuck with us up to this point. We can now promise you that this is the jumping off point for a larger educational movement, driven by youth teaching other youth. This piece is just a culmination and a result of all the experiments that came before it. Stay tuned. We very pleased to announce the first Cambodian educational tour of “See You Yesterday,” with performances for student teachers, students, and the general public in three educational centers later this month. Following each performance in Battambang, Phnom Penh, and Siem Reap, the cast–with support from Global Arts Corps artists from South Africa, Cambodia, Kosovo, and the US–will conduct workshops in the art of exploring one’s past. These workshops will take place the country’s teacher training centers, the institutions where all of Cambodia’s future educators receive their training. The workshops will be the beginning of what we hope will become an ongoing opportunity for this cast to share their experiences of delving into their own emotions and perceptions to build this production out of the fragmented memories handed down by their elders who experienced them directly. The production itself was created out of these young artists’ exploration into their past, in which they broke down barriers of silence that had existed between generations since the genocide. The goal of this tour is to specifically help student teachers develop curriculum to illuminate and expand the potential of the theatrical arts to foster perceptual change, dialogue and understanding around some of the most difficult subjects in their recent history. For more information on the tour, and to read the artistic director’s statement, please click here. Stay tuned for more information on this project in the coming weeks! Hugh Masekela, the legendary South African jazz musician, leading international voice against Apartheid, and our beloved collaborator, has died at 78 after a protracted battle with prostate cancer. We were profoundly blessed to work with Hugh on our production of “Truth in Translation.” His composition of the score amplified the sounds of a nation which uses music as its language of survival and celebration. I’ve never met a greater reconciler – a man who could fuse opposing forces, who could sculpt a score to reveal the humanity of a cast, who could craft beautiful harmonies out of discord and pain. More powerful a testament than my words is his music itself. We remember a particular night in Edinburgh, while on tour with “Truth in Translation.” In an improvised concert, Hugh took the stage with the cast and moved the entire audience to their feet. We were lucky enough to capture some of it on film here. Thank you, Hugh Masekela. You gave us courage when we needed it most, and we are eternally grateful that you leave behind your music to inspire many more fights for freedom. The past 12 months have been a time of momentous change. Division seems pervasive, and unity fragile and elusive. In response, all of us at Global Arts Corps have renewed our commitment to working with the next generation of young artists, educators, and activists and feel certain that this growing movement is more important than ever. The reach and relevance of our Cambodian production, “See You Yesterday,” continues to grow. After traveling over 5,000 miles to Rwanda last year to share a story built out of their fragmented, inherited memories of the Khmer Rouge, the 19 young circus performers in our cast are now ready to share what they learned on the road. In 2018, they will tour Cambodia, performing outdoors for the public and conducting post-performance workshops at schools and at teacher training centers. Additionally, the documentary film, “Year Zero36,” which follows the development of the production, the trials and triumphs of its young cast, and the culminating performance in a Congolese refugee camp, will be shared with audiences worldwide. Simultaneously, our research and development continue for our newest project – an immense, multi-year, multi-pronged initiative born out of our work over the last 15 years that will bring many different powerful stories of past and present conflict together on one stage, at one time. In 2018, we’ll begin to develop pieces of the final production on multiple continents, highlighting the efforts of women’s movements past and present and working with refugee and host communities, among many others. Stories from each of these places and more will be shaped into a single kaleidoscopic production exploring multiple conflicts as they move backwards in time, all examining violence, fear, courage, denial, shame, and hope across borders and across generations. This project will live on in a multimedia online educational archive that will allow participants to study the various smaller theatre pieces and conflicts that contribute to the larger whole, finding connections across an infinite number of combinations….and serving as an open space for transformative dialogue between people who’ve never talked to each other before. Consistently, throughout all of these projects, our programs and techniques of learning and empathy exploration multiply as the number of our international youth mentors grows. The fact that this team is made up of teachers from totally disparate cultures reminds us that no matter where we’re from, we wrestle with the narratives that have been passed on through generations. Your support contributes to our efforts to help youth embrace and honor all of their conflicting identities – without shame and with empathy – in the face of entrenched difference. Global Arts Corps is funded entirely by donations. We hope that you will support these efforts by making a tax-deductible contribution – either through our website, or by mailing a check to Global Arts Corps at 790 Riverside Dr. #6P, New York, NY 10032. Thank you, and happy holidays from all of us at Global Arts Corps. Our dear friend and colleague, rights advocate, philanthropist, and civil society figure, Osman Kavala, was arrested by Turkish officials in October and has been detained for nearly a month. We are privileged to call Mr. Kavala a friend and colleague, who, over the course of several decades, has used arts, culture, and dialogue to facilitate exchanges throughout Europe. We attest without doubt to his decency, loyalty, and commitment to peace and join with the extraordinary artists and peacemakers signing this petition. Global Arts Corps featured in the UNESCO Courier! Global Arts Corps is honored to be featured in an article in the latest issue of The UNESCO Courier, entitled “Breaking the Cycle of Vengeance,” by Rwandan journalist Marie Angélique Ingabire. To access the full issue through UNESCO’s website, please click here.